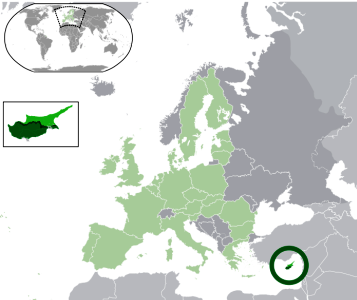 Cyprus is a small island situated in the Eastern Mediterranean, not far from the Turkish coast. It is divided into a Northern section controlled by Turkey and a Southern section (ca. 60% of the area) that is in the EU and the Eurozone. Cyprus joined the Eurozone and issued its first coins in 2008. Prior to the Euro the official currency was the Cyprus Pound. The conversion rate to the Euro was set at 0.585274 to 1Euro on 1st January 2008. For more information on Cyprus,try this link. Return from Cyprus to Cyprus Euro Coins.